Just in time for hoops season, Nazareth H.S., East Flatbush, has completed renovations of its gymnasium, including a new court and new bleachers. Kingsmen Court will serve as the 2017-2018 home of the Kingsmen and Lady Kingsmen. Several former Girls CHSAA basketball players have earned pre-season honors in the Metro Atlantic Athletic Conference (MAAC). Aryn McClure, a graduate of Archbishop Molloy H.S., Briarwood, was named MAAC Preseason Player of the Year after averaging 9.1 pts. and 5.8 rebounds per game last season for Quinnipiac University, Hamden, Conn. She is the first player in Quinnipiac program history to earn the honor. McClure was also named to the Preseason All-MAAC First Team along with Quinnipiac teammate Jen Fay (Nazareth H.S., East Flatbush) and Kollyns Scarbrough (Christ the King H.S., Middle Village) from Siena College, Albany, N.Y. Amani Tatum, an Archbishop Molloy graduate who plays for Manhattan College, the Bronx, was named to the Second Team. Raven Pitt is surrounded by some of her teammates as she announces she will attend Wagner College. 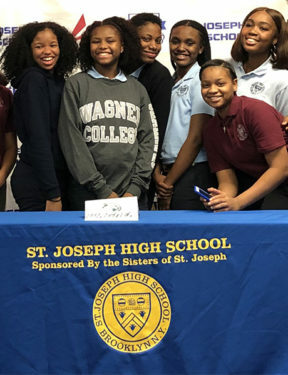 Raven Pitt, a senior guard on the St. Joseph’s H.S., Downtown Brooklyn, girls’ varsity basketball team, signed her National Letter of Intent to continue her hoops career at Wagner College, Staten Island. The team captain and 2016-2017 Tablet All-Star averaged 15.0 pts. and 5.0 assists per game as a junior. She is pictured at center with her teammates.